Olympian Elaine Thompson Awarded Chancellor’s Medal — UTech, Ja. 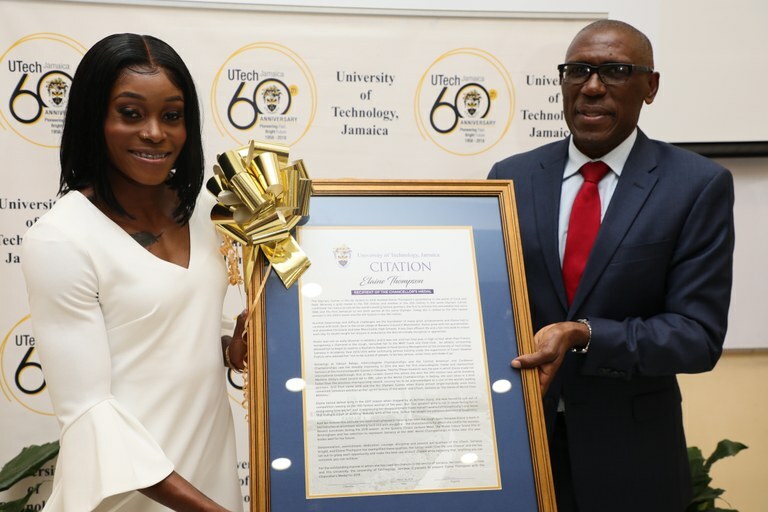 Olympian Elaine Thompson accepts her citation for the University of Technology, Jamaica Chancellor's Medal Award being presented by Mr. Michael McAnuff-Jones, Deputy Chairman of Council, University of Technology, Jamaica. 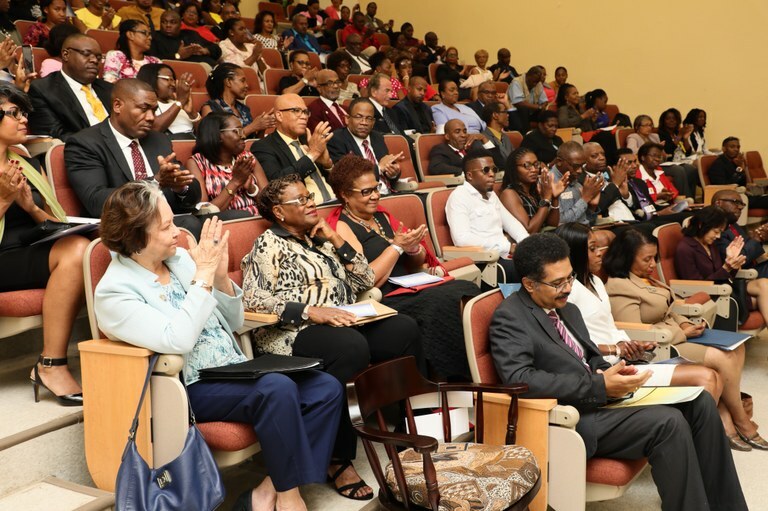 The citation was presented at a special ceremony for the presentation of the 2019 Chancellor's Medal Award and 60th Anniversary Outstanding Alumni Awards held on Thursday, March 28, 2019 at the University's Papine Campus. 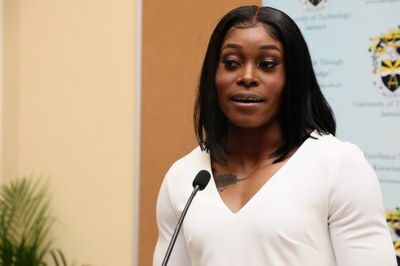 Olympian and UTech, Jamaica/MVP athlete, Elaine Thompson was presented with the University of Technology, Jamaica Chancellor’s Medal Award on Thursday, March 28, 2019 at a special ceremony hosted by the University at the Papine Campus for the presentation of the 2019 Chancellor’s Medal Award and the presentation of Outstanding Alumni Awards. In his welcome, University President, Professor Stephen Vasciannie explained that the Chancellor’s Medal is the University’s most prestigious non-academic award of equal status to an Honorary Doctorate which is awarded by the Chancellor to recognize the contribution of an individual or institution whose contribution is of national or international significance. The citation by University Orator, Mrs Pamela Kelly on the Olympian, lauded her for her “outstanding manner in which she has used her chances in the service of Jamaica, her community, her club and this University.” The citation acknowledged that the Olympic Games in Rio de Janeiro in 2016 marked Elaine Thompson’s ascendency in track and field, where she won a gold medal in the 100 metres and another in the 200 metres. Today she is ranked as the fifth fastest woman in the 200m and the fourth fastest in the 100 metres. Special Recognition Awards were presented to the Jamaica Hotel and Tourist Association and the Jamaica Tourist Board. 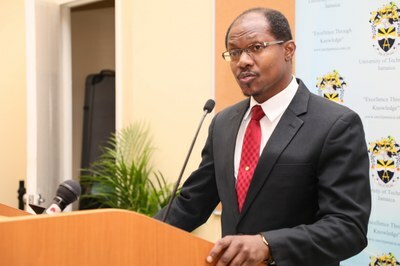 The citations by the University Orator on both entities elaborated on their extensive achievement in building brand Jamaica on the world stage. Mrs. Camille Needham (right), Director, Jamaica Hotel and Tourist Association (JHTA) listens as University Public Orator, Mrs. Pamela Kelly reads the citation for the Special Recognition Award presented to the JHTA. 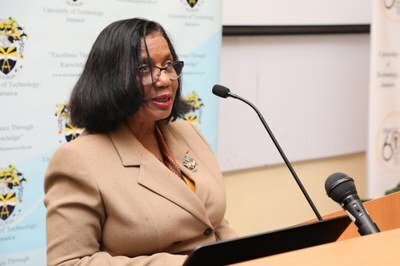 Executive Director of the JHTA, Mrs Camille Needham in her response said that the JHTA has had “a long and fruitful relationship with UTech” particularly with the School of Hospitality and Tourism Management (SHTM) where she has served on advisory committees. 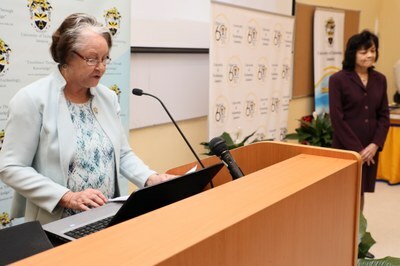 Mrs. Needham thanked UTech, Jamaica for the honour and noted that students of the SHTM have been a credit to the JHTA in its activities. “We will treasure and find a special place at the JHTA to place this recognition” she noted. 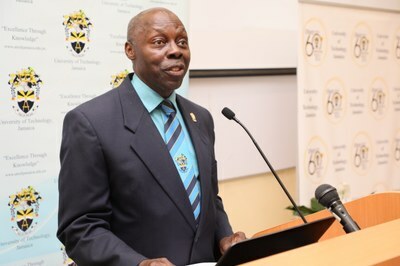 During the special University of Technology, Jamaica 60th Anniversary awards ceremony, nineteen (19) alumni of the institution received the Outstanding Alumni Award in the three categories of Service to the University, Service to the Country, and Service to the University and Country. Mr Hector Wheeler, Associate Vice President, Advancement provided an overview of the Outstanding Alumni Award. 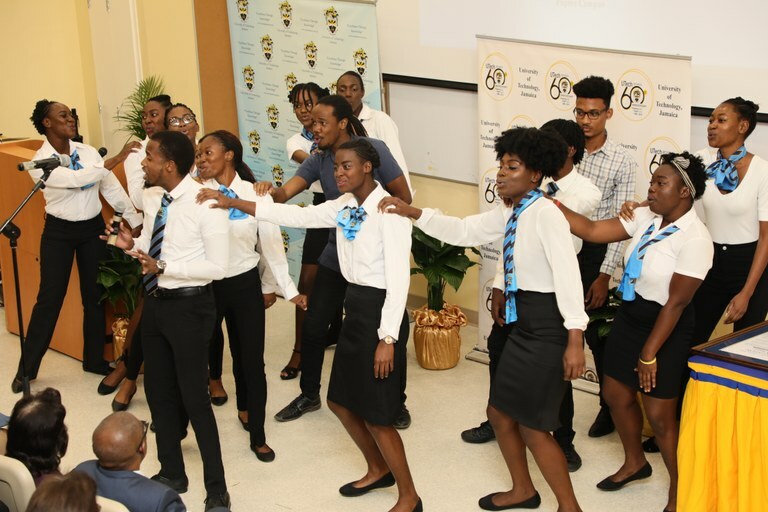 He explained that UTech, Jamaica issued a call for nominations for the award in celebration of the University’s 60th Anniversary. “The submissions were reviewed by a special Outstanding Alumni Awards Committee which carefully and rigorously examined the recommendations,” he reported. Responding on behalf of fellow alumni awardees, Mr Oral McCook, Managing Director, OGM Integrated Communications Limited expressed gratitude for the “great honour that has been extended to the awardees.” He added that, “we benefited from the core belief of the institution that education is not an abstract concept but is about educating and equipping persons to realise their full potential and to achieve their personal ambition, whilst contributing to national development." The ceremony was chaired by Professor Colin Gyles (at podium), Deputy President. A section of the large audience applauds. Professor Stephen Vasciannie, President, UTech, Jamaica presents the Outstanding Alumni Award for Service to the University. Professor Stephen Vasciannie, President, UTech, Jamaica presents the Outstanding Alumni Award for Service to Country. Professor Stephen Vasciannie, President, UTech, Jamaica presents the Outstanding Alumni Award for Service to the University and to Country. - Given exceptional support to the University; supporting the University’s image building campaigns and giving his time, energy and resources to facilitate successful activities in the School of Business Administration especially in the Students’ Seminar module. - An excellent ambassador for the University. - President, National Water Commission – 21 years with NWC. - A leader who is aware of NWC’s critical role in national development and uses his expertise to positively impact the company’s operations. - Currently chairman of the Cabinet appointed Enterprise team in pursuit of Public Private Partnership for water projects. - She has a steadfast dedication to Jamaica’s advancement and its labour force. She has established several successful projects to support the development of Jamaicans as an invaluable resource. - Served as Group Head of Banking Operations, Scotiabank; Senior VP in charge of HR for the Scotia Group, Jamaica, Belize and Haiti and Regional Head of HR for 18 countries of Scotiabank’s English Caribbean Operations. Scotiabank is a major employer of UTech, Jamaica graduates. - Served as President and Immediate Past President, Human Resource Management Association of Jamaica and the Jamaica Institute of Financial Services. He was also on the Merger Oversight Committee for the Child Development Agency, Office of Children’s Registry and National Parenting Support Commission. - Led several teams to provide dental treatment and other medical relief outreach to several communities: Rocky Point and Morant heights in Clarendon, Waterford in Portmore, St Catherine, Belfield, St Mary, Trelawny Infirmary and others. - Recognized by her peers through the Students’ Union for her contribution to community service and her contribution to student development. 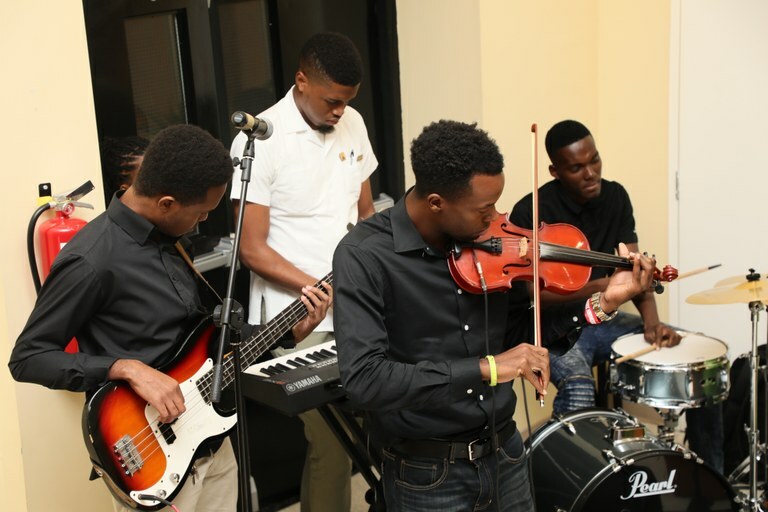 Superb entertainment was provided by the UTech, Jamaica Choir and the Instrumental Band. 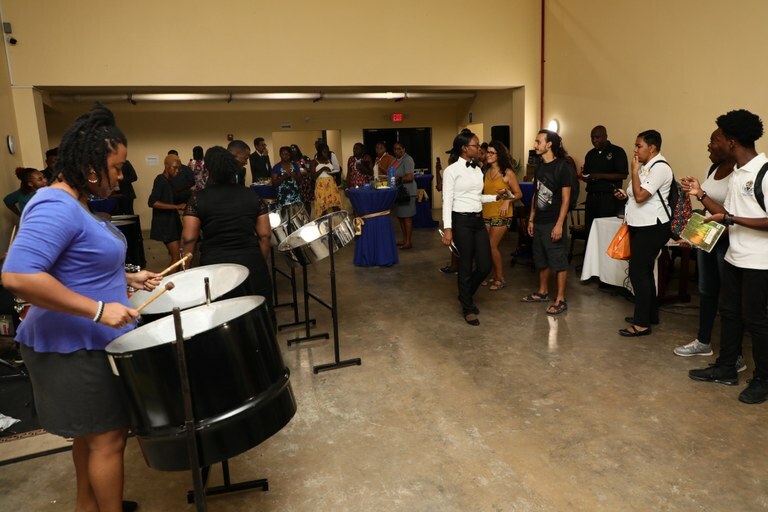 The UTech, Jamaica Steel Pan entertains at the reception following the ceremony.